Zipping along the track with the teams! Who can resist these adorable little guys? What type of equipment do you need to race in -40 degree weather? You’ll learn all about it. Be sure to thank your furry, four-legged guides! Lots of photo opportunities on this tour! There are so many interesting facts about huskies and racing life – guests always leave with a deep appreciation for Alaska’s state sport of mushing. It’s hard to believe that it won’t be long before these guys are racers! The adorable husky puppies are very friendly – time is reserved to spend with them! 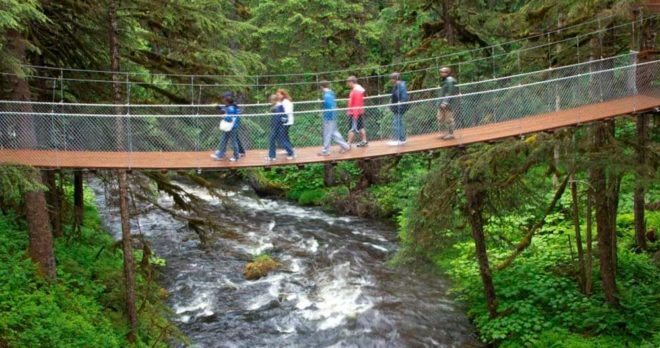 A suspension bridge overlooking Fish Creek: the surrounding area is absolutely beautiful! Join real Alaskan husky sled teams for a ride on the Juneau Sled Dog Discovery. This tour actually puts you in the seat of a custom, wheeled dog cart being pulled by a team of 14-16 Alaskan huskies. Professional mushers, who race with these same teams in the winter, provide a glimpse into Alaska's state sport with you on board! Join them and their teams for a 1-mile ride through Tongass National Rainforest on beautiful Douglas Island. After the ride, you'll be treated to a informative presentation with a knowledgeable dog handler and a retired sled dog. Together they showcase what it takes to run the arduous winter races such as the Iditarod, by exploring the equipment, nutrition and care required for a husky team. And after the presentation, you'll have time to spend and interact with the adorable husky puppies! With a pick-up right from the cruise docks, the tour begins with a short drive out to Douglas Island, where these teams call home for the summer months. You'll meet the mushers and excited dog teams who are ready and willing to take you for a ride! You can literally feel the excitement as they begin lunging forward and the cart begins rocking before the musher releases the brakes...and you're off! Mushers begin issuing commands and instantly you're being pulled by a team of 14 huskies. As you're seated between the musher and his team, you can feel the bond and the relationship they share, which is cemented as the musher may recount stories of their training or racing efforts. It quickly sets in that this just isn't a staged tour, but a way of life for these mushers. The 'kennel talk' after the ride answers any lingering questions before you have time to visit with the husky puppies. You can hold them if you're feeling up for it! You'll undoubtedly leave this tour with some amazing pictures to share from your Alaskan excursion! Minimum Age: All ages are welcome on this tour! Accessibility: Most special needs can be accommodated on this tour. Must have mobility to walk 100 yards either on your own or with assistance. Must be able to raise knee approximately 12 inches. Q:How long is this excursion, and is transportation to and from your camp included? Q:Do I get to drive the sled? No one knows the dogs like their mushers, for this reason, passengers are not allowed to drive the sled. Driving the sled, as well as keeping the dogs in line, takes skills and knowledge that is only acquired through experience. Q:How long is the sled ride? Is it bumpy? The sled ride is about a mile long. Sometimes, the ride can be a little bumpy, but our guides are usually able to avoid the bumps well enough. The speed, as well as the exact timing, of the ride is dependent upon both the dogs’ performance as well as the weather on the day of your visit. So, there is truly no way for us to say exactly how fast the sled will go on any given run. Q:How many people will fit on the sled? Six guests, plus the musher, go together on the sled. We normally run more than one sled at a time, so we can easily accommodate larger groups. Q:Is the sled ride on snow? In both Skagway and Juneau, our excursion takes place on the ground in the woods, and we use a customized summertime wheeled sled. Our summertime sleds are a great way to experience mushing without the cold temperatures and heavy snow of wintertime Alaska.